Last week, we saw Lisa Barone and Joe Hall have a professional skirmish over the value of content marketing. I found myself torn between the two arguments. On one hand, all the content in the world can’t save your brand from a bad product. On the other hand, generating content that informs and enriches a customer’s opinion of your product will help overcome misconceptions about its value. The world of online reviews. Let’s face it, the best kind of content about your brand or product doesn’t come from you, but from consumers. If you haven’t already bought into the power of online reviews, now’s the time to do the research. Cone’s 2011 Online Influencer Trend Tracker study found that four-out-of-five consumers decided against purchasing a product based on negative feedback in an online review. That means that after pouring resources into blogging, paid ads, and social media management, if enough customers hate your product and write about it online, you’ll lose the sale. There is an upside. Just over 4-out-of-5 consumers have used positive reviews to affirm their purchasing decisions. As marketers and business owners, we need to focus on the upside of online reviews and harness their influence, prevalence, and conversion power as a content marketing tool. Working with the right SEO consulting firm is just one part of the process. To truly be successful, you need to empower your customers to voice their opinions, for better or for worse, and use that feedback as a way to increase conversions and shorten the sales cycle. I’ll start with the disclaimer that, in the process of generating online reviews, you may not like what you see. Even a fantastic product or service will have its naysayers. For businesses such as restaurants, lawyers, and doctors, the entire establishment is often the target of a review, rather one dish, client call, or office visit. In these cases, it’s easy to get defensive or ignore online reviews altogether. While an overwhelming amount of negative reviews may deter consumers from purchasing from you, a preponderance of positive reviews might send up some red flags as well. In my other life as a Yelp Elite, I’ve seen business owners make the mistake of lashing out against negative reviews, and the result is usually pretty ugly. Consumers are looking for a fair and balanced source for reviews (if they only wanted the good news, they’d rely solely on the content you provide). Weighing out the good with the bad allows consumers to feel engaged in the evaluation process. By the time they decide to go to your restaurant or click “submit order”, they should feel as though they’ve made an informed decision. So how do you generate reviews that help your potential customers feel empowered? I could gush about the value of off-site review outlets all day, but that’s a different post. Today, let’s focus on on-site reviews. If you view producing unique content on a regular basis as a chore, think of on-site reviews as the answer to your prayers. On-site reviews are particularly valuable to retailers. If a consumer can’t touch or try on your product, reassurance from previous customers will help build the trust necessary to make the purchase. Resellers can benefit from positioning themselves as an authority in the space by being the go-to site for product reviews and information. 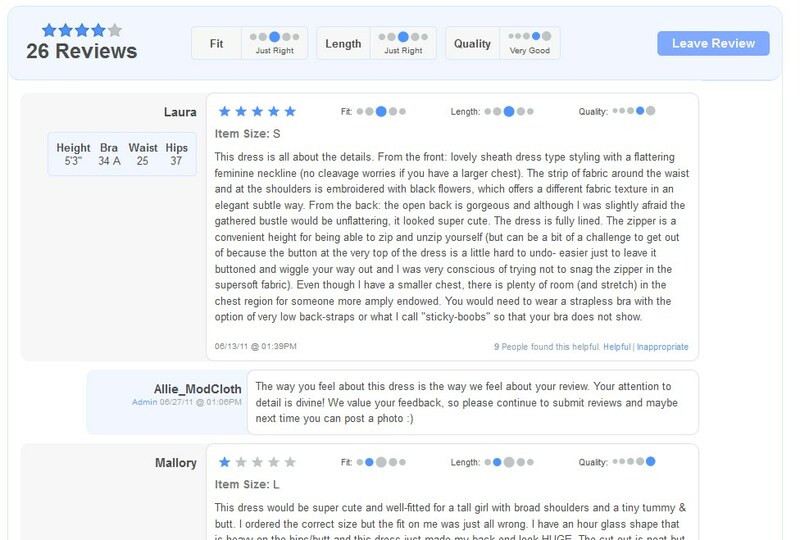 Not only does ModCloth break down three dimensions of the product, but they give the user the option of sharing their personal measurements so that other buyers can match themselves up with similar body types. The ModCloth admin’s response is an encouraging indicator that they’re engaged with their customers. Depending on how many reviews you generate, it might not be feasible to leave a response to every review. But you definitely want to call attention to reviews that are balanced, detailed, and keyword rich. Based on this review, I am more likely not only to buy this product, but to leave a review after my purchase as well. You may not have the ability to allow users to post their own content to your site. In that case, identify the most valuable off-site review outlets. Although you won’t be able to generate individual product reviews, you will at least be able to establish overall credibility. Google Places, Yelp, and Citysearch tend to be the biggest players in the field, but you may find a relevant vertical review site that is used by your target customer base. Take a look at Lisa’s recommendations for generating Yelp reviews for a great example of a call-to-action page [provided by Mat Siltala] that links out to major review sites. The result provided by Rotten Tomatoes provides much more valuable information than the Yahoo result. I can clearly see the overall rating for the movie, how many reviews this is based on, and information about the director and actors. The valuable information about peer reviews provided up front in the SERPs drew me in, and the additional quality content kept me there. That means more exposure to on-site advertising and more money for Rotten Tomatoes. Again, you may not have the internal resources to implement rich snippets on your site. In that case, I recommend checking out services such as Bazaarvoice or PowerReviews that can implement a soup-to-nuts rating system on your site. As Aaron Bradley pointed out in his examination of microformats and structured data as a ranking factor, employing schemas for your product reviews does not guarantee that you will rank higher for a given product. But from a user standpoint, the more information you supply to help the searching and sourcing process, the more apt they’ll be to choose your site. If your content is rich and engaging enough, not only are they more likely to buy from you, but their continued engagement with your content will increase the authority of your page. Why are online forms the ultimate form of content marketing? Because they not only help inform and influence potential customers, but they can also help us evaluate our products as well. As Joe highlights in his argument, a great product can speak for itself, but as Lisa reminds us, content marketing gives that product a voice. Think of online reviews as your content marketing megaphone.